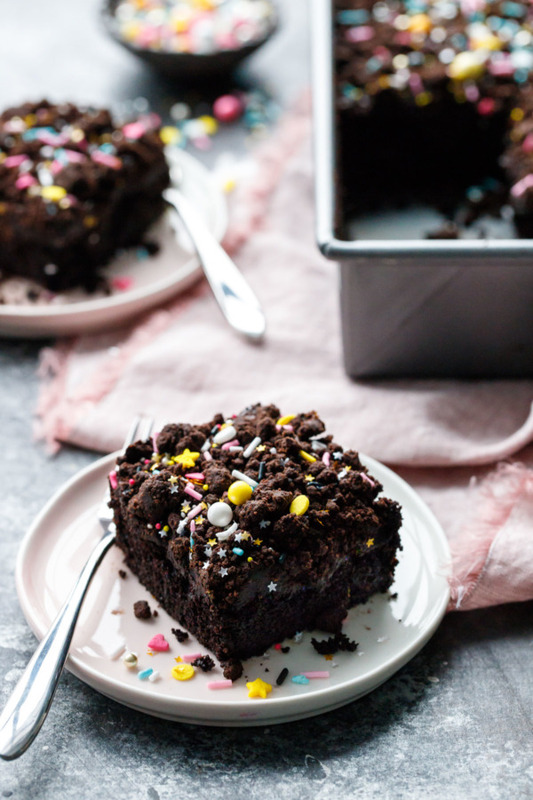 This chocolate blackout sheet cake is for serious chocolate lovers only, topped with dark chocolate glaze and a layer of sweet and salty cookie crumbles. 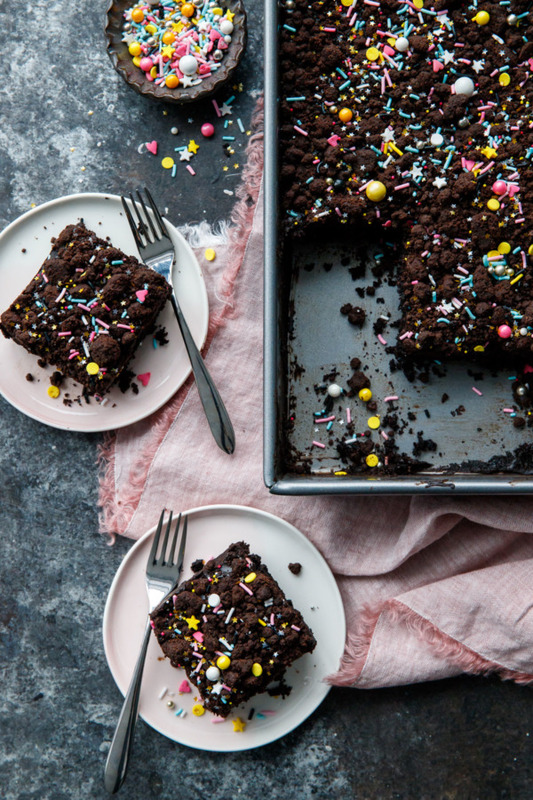 Darker than the darkest night, this sheet cake recipe takes dark chocolate to entirely new depths. The cake itself is moist and surprisingly light, with an intense dark chocolate flavor that takes center stage. 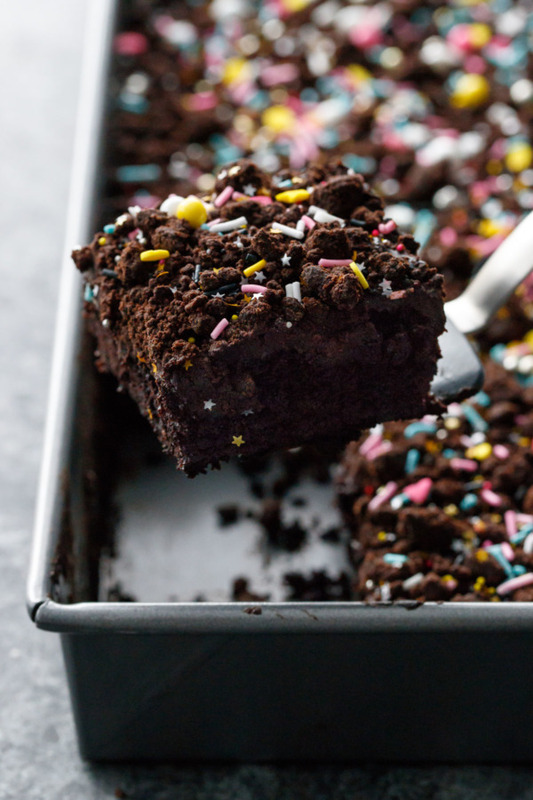 Add to that a rich chocolate glaze and crunchy cookie crumbs liberally sprinkled on top and you’ve got yourself one heck of a sheet cake. 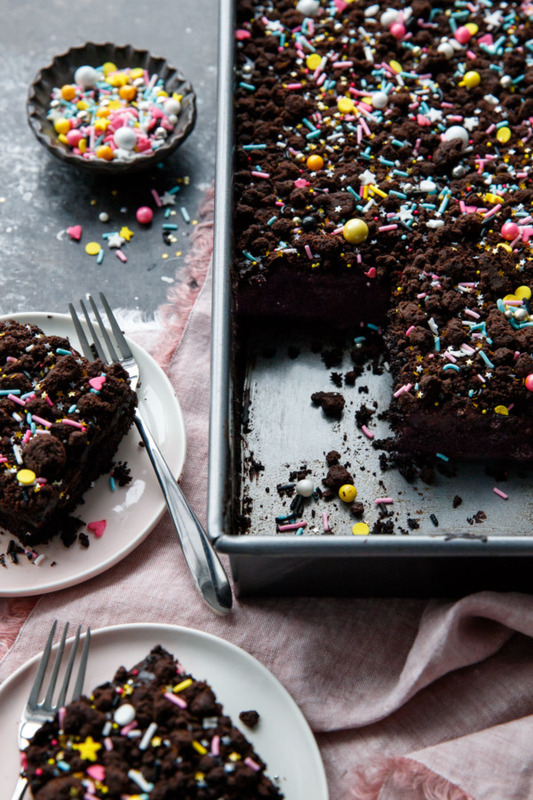 Set your expectations aside: this is unlike any chocolate sheet cake you’ve ever encountered. Typical it is not. Far from it. It’s is a true grown-up chocolate cake with a intensity of flavor unlike any cake I’ve made before. Comparing this cake to a typical Texas sheet cake is like comparing a piece of expensive ultra dark chocolate and a gas station candy bar. I mean, talk about night and day. 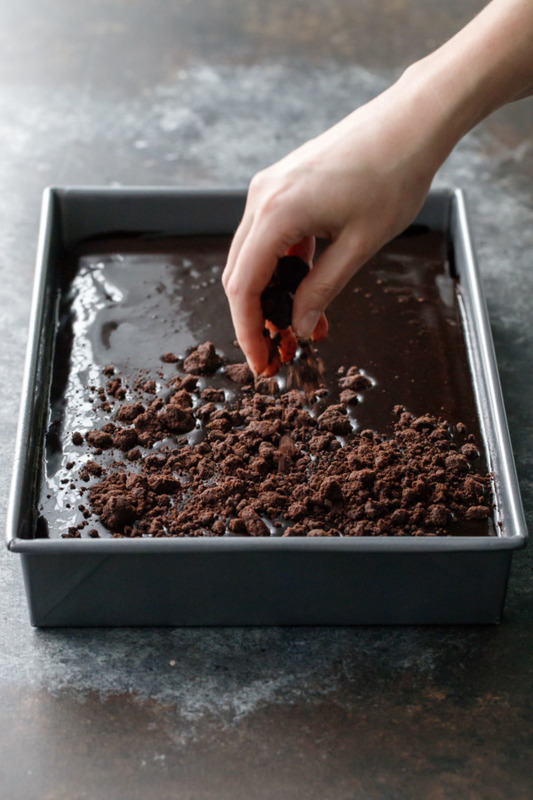 For one thing, it’s not nearly as sweet as most chocolate sheet cakes, with a more intense chocolate flavor thanks mostly to the addition of black cocoa as well as Dutch processed. The glaze falls somewhere in between a chocolate donut glaze and silky smooth, bittersweet chocolate ganache. The best of both worlds, if you will, and certainly not your typical shiny and saccharine sheet cake glaze (and I really don’t mean to keep ripping on Texas sheet cake here, I actually like them, but most people are familiar with what a Texas sheet cake is so it makes a good reference point to help me describe what this cake is, and what it is not). The final touch is the chocolate cookie crumb, adapted from Christina Tosi’s recipe. The crunchy, salty crumbs taste like a grown up Oreo cookie, less sweet and with a more pronounced chocolate bitterness (in a pinch you could use crushed up Oreos here instead). They’re also delightfully salty, the perfect textural contrast and flavor amplifier. 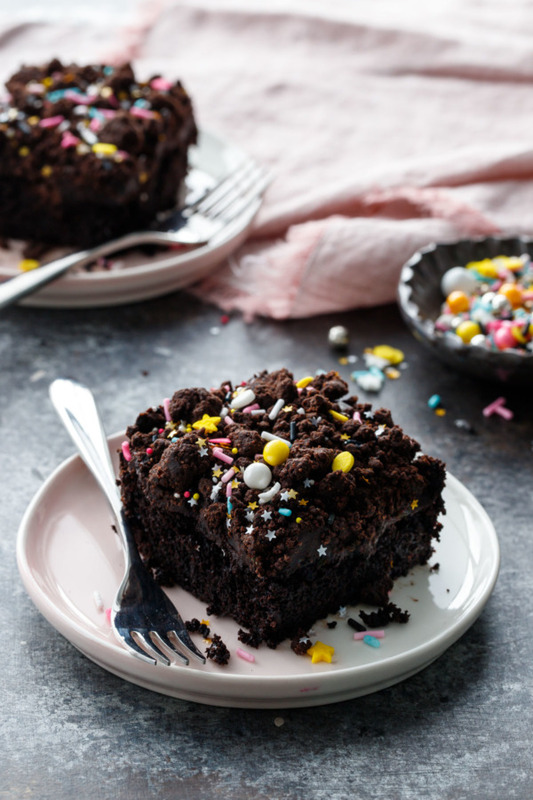 It’s the combination of the glaze, crumb, and a liberal dose of sprinkles that makes this cake so gloriously messy. You’ll have crumbs and sprinkles on your lap and smudges of chocolate on your face, but, you know what? 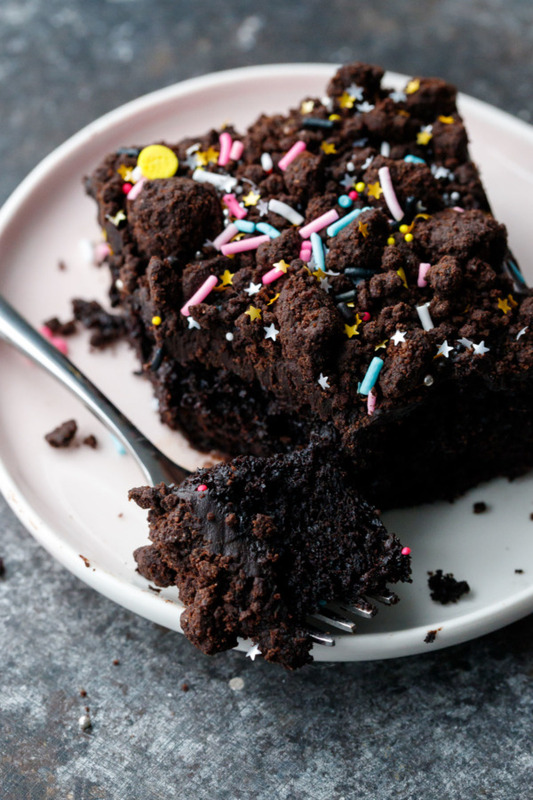 You won’t care because it’ll be the best piece of chocolate cake you’ve ever devoured. I debated long and hard what to call this cake, since plain old ‘chocolate sheet cake’ didn’t seem quite descriptive of just HOW dark this chocolate cake is. I mean, what’s darker than dark chocolate? If there were such a word to describe it I’d surely be using it here. Someone looking for a basic chocolate sheet cake probably won’t like this recipe. And the last thing I want to do is disappoint. So if you’re after a barely brown chocolate sheet cake with an overly sweet powdered sugar glaze, best look elsewhere. I toyed with calling it midnight cake, or black magic cake, even eclipse cake was an idea that came up in the facebook group. But ultimately I went with blackout, as the classic Brooklyn Blackout cake features a similar layer of cookie crumbs that seemed like a fitting descriptor. It’s hard to ignore the sheer simplicity of sheet cakes. Sure I’ve managed to make it a bit more complex, what with the homemade chocolate crumb and all, but still, there’s no tricky stacking, trimming or fancy frosting involved. Just bake the cake in a 13-by-9-inch cake pan (preferably a metal one with nice square corners). Pour on the glaze while the cake is still lukewarm, then dump handfuls of cookie crumbs and sprinkles on top. Let it set for a bit and then dig in! Like any chocolate dessert where the primary flavor comes from the cocoa, quality matters. For an even darker chocolate cake, I swapped 2 tablespoons of the already dark Dutch-process cocoa for Black cocoa powder (I used Guittard Cocoa Noir, and yes I have a 5lb bucket of it, why do you ask?) Black cocoa is further alkalized to make it even darker even than Dutch-processed. 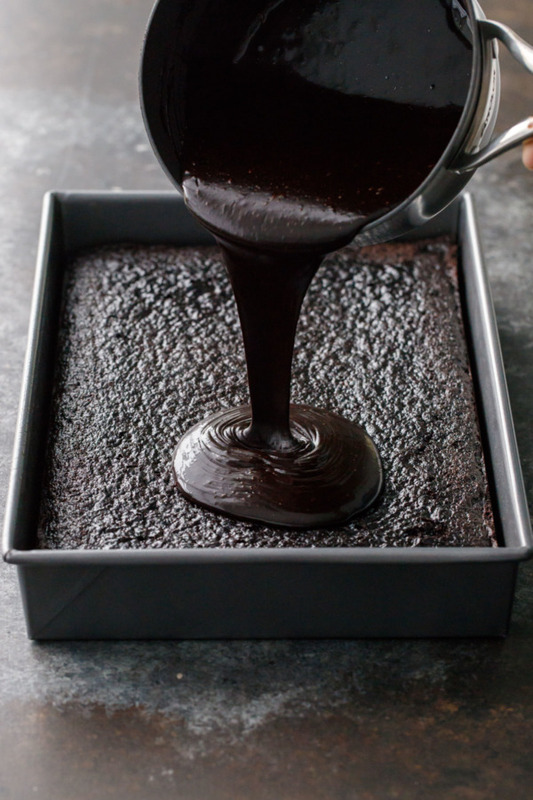 Keep in mind, however, that this additional processing results in a lower-fat product, so you don’t want to use all black cocoa in this recipe or your cake will end up too dry. My favorite Dutch-process cocoa powder is Cacao Barry Extra Brute. Seriously, get yourself some. It’s the best value for one of the best quality cocoas on the market. I haven’t purchased grocery store cocoa powder in years. 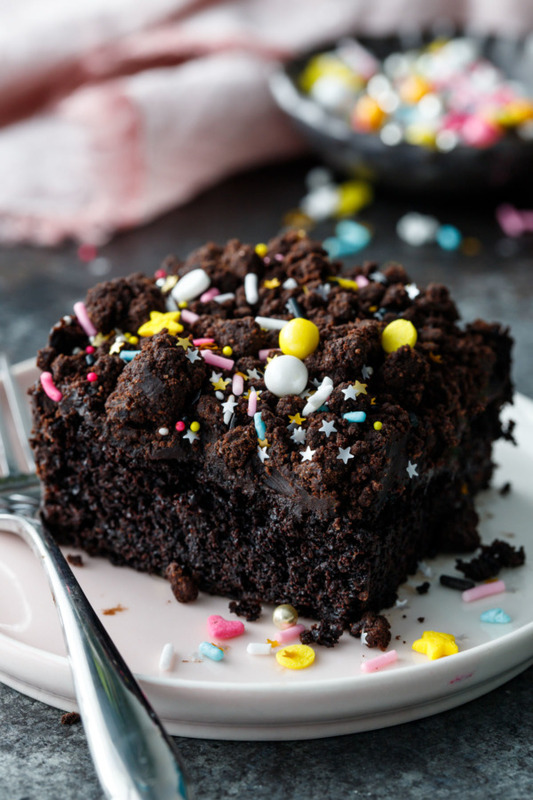 I have not tried this recipe using natural cocoa and can’t attest as to the results; you’ll likely end up with a cake that’s much lighter in color and more bitter/acidic due to the increased acidity of the natural cocoa. My advice? Buy yourself a big bag of Cacao Barry and your baked goods will be all the better for it. 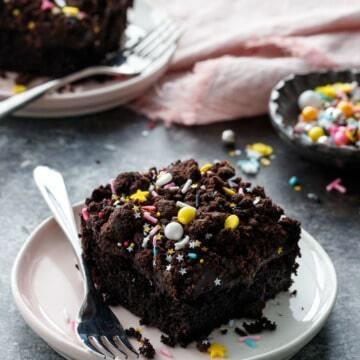 The sprinkles are optional, of course, but they sort of give this cake an almost galaxy-like feel. I used a sprinkle medley called Splendor from Sweetapolita (<<< use code LOVEANDOLIVEOIL15 and get 15% off your first order!) Unfortunately this particular medley appears to be discontinued, but there are plenty of other fabulous options. 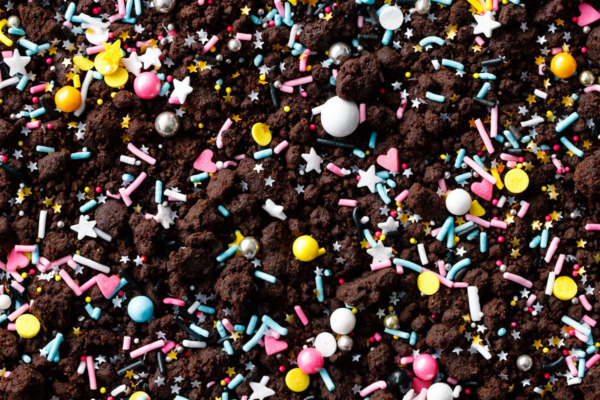 Because, let’s admit it, everything is better with sprinkles. 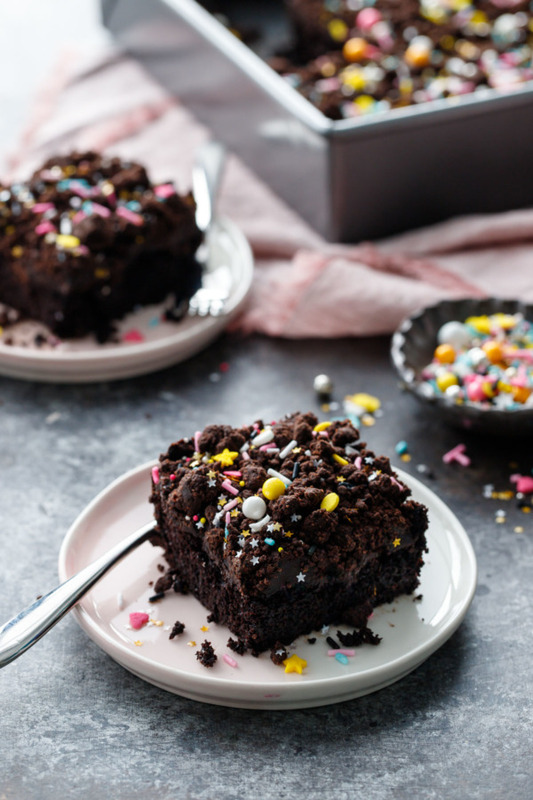 This ultra dark chocolate sheet cake is for serious chocolate lovers: with a dark chocolate glaze and a layer of crunchy cookie crumbles to top it off. Preheat oven to 300 degrees F. Line a baking sheet with parchment paper or a silicone baking mat. In a bowl or the bowl of a stand mixer, whisk together flour, cocoa powder, sugar, cornstarch and salt until evenly incorporated. Drizzle in melted butter and mix until no dry ingredients remain and mixture forms rough crumbles. Dump onto prepared baking sheet, spreading crumbles out into a single layer and breaking up any extra large pieces. Bake for 20 minutes, stirring once part way through. Let cool completely. Crumbs can be made a few days ahead of time and stored in an airtight container at room temperature until ready to use. Preheat oven to 350 degrees F. Generously butter or grease a light or medium colored metal 13-by-9-inch baking pan (if using a dark metal or glass baking pan, I recommend reducing the baking temperature by 25 degrees to avoid overcooking). In a bowl, whisk together flour, cocoa powder, baking soda, baking powder and salt. In another bowl or large 4-cup glass measuring cup, whisk together sugar, buttermilk, oil, eggs and vanilla until evenly incorporated. Make a well in the center of the dry ingredients and pour in buttermilk mixture. Whisk until combined and no dry ingredients remain. Pour into prepared pan, spreading the batter into an even layer. Bake for 25 to 28 minutes or until center is set and a toothpick inserted near the center comes out completely clean. If it still has some moist crumbs attached to it, bake it for a few minutes more. Let cool on a wire rack while you prepare the glaze. Combine cream, butter, sugar and corn syrup in a medium saucepan. Stir gently over medium heat until butter is melted and sugar is dissolved. Remove from heat and stir in vanilla and chocolate chips. Gently stir until chips are completely melted (if the residual heat isn’t quite enough to melt the chips, return to burner set to low for 30 seconds, then remove from heat and continue stirring). Sifted cocoa powder over top and whisk until smooth. Pour glaze over lukewarm cake. 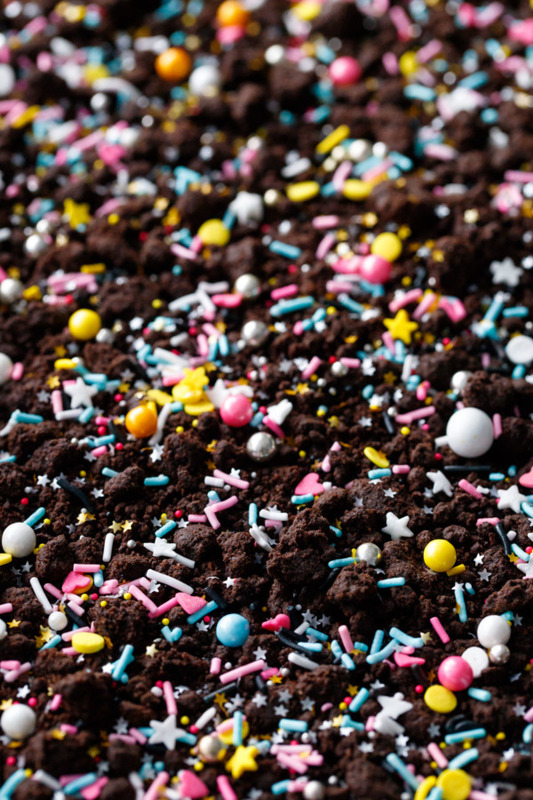 Generously sprinkle chocolate crumbles over top of liquid glaze, along with any sprinkles as desired for decoration. Let cool completely at room temperature then refrigerate for at least 1 hour before slicing and serving. Cake will keep, tightly covered in the refrigerator, for up to 3 days. *For an ultra dark chocolate cake, substitute 2 tablespoons/20 grams of black cocoa powder in place of the Dutch process. Don’t use all black cocoa, however, as it is significantly lower in fat and will result in a drier cake. **If using thick, whole buttermilk, use 1 cup buttermilk and 1/4 cup water.